Athens, Greece - December 10, 2014 - Capital Ship Management Corp. announced that Mr. Evangelos Marinakis, the Chief Executive Officer of Capital Maritime & Trading Corp. who is also Chairman of the Board of Directors of Capital Product Partners L.P., , was selected as Lloyd’s List’s "Greek Shipping Newsmaker of the Year” for 2014. 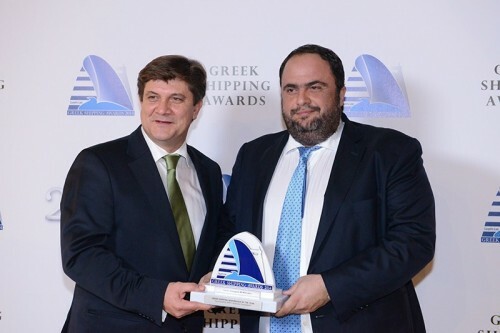 Mr. Marinakis was commended for completing a major round of tanker and containership investments, strengthening Capital Product Partners, introducing IMO sustainable shipping principles to Capital Ship Management Corp., and entering into politics as a councilman for Piraeus, aiming to promote the city as an international shipping center and cruise hub. The award was presented at the annual “Lloyd’s List Greek Shipping Awards” ceremony at the Intercontinental Hotel in Athens, Greece on December 5, 2014. It is the second time that Mr. Marinakis received this distinction since 2010.